Bluegrass Pundit: Jihad strikes Boston: Bomber brothers are Chechen's with an interest in radical Muslim ideologies. 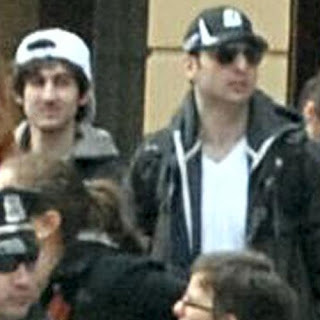 Jihad strikes Boston: Bomber brothers are Chechen's with an interest in radical Muslim ideologies. The brothers’ alleged motive in Monday’s bombings remains unclear, but in the last several months, Tamerlan Tsarnaev had posted videos to YouTube indicating his interest in radical Muslim ideologies. The family appears to be originally from the southern Russian republic of Chechnya, and two law enforcement officials said there is a “Chechen connection” to the bombings. Chechnya has been racked by years of war between local separatists and Russian forces and extensive organized crime since the Soviet Union dissolved in 1991. The extent of the possible connection remained unclear, and some reports indicated that the family had also lived in Kyrgyzstan, in Central Asia. According to a database search, Tamerlan Tsarnaev was a boxer who worked out at a martial arts facility in the Cambridge area. On a YouTube channel, Tamerlan created a video file called “Terrorists,” where he posted footage that has since been removed from view. He also shared other videos of lectures from a radical Islamic cleric. In one video, Arab voices can be heard singing as bombs explode from high-rise buildings.